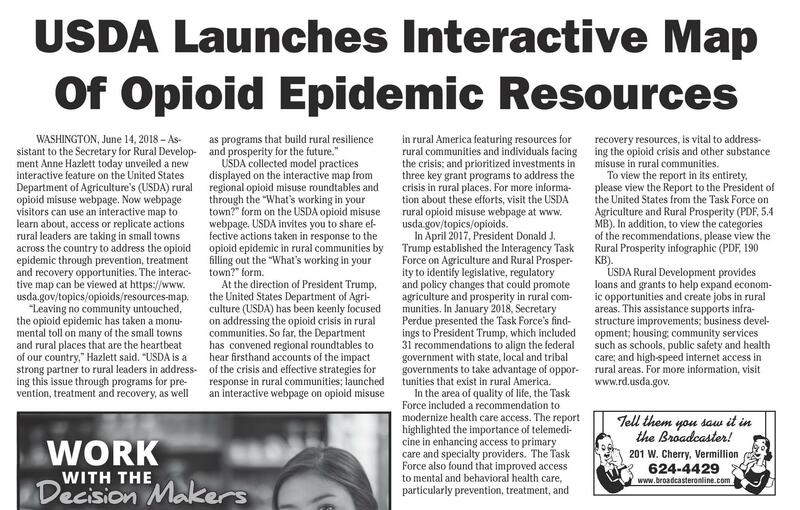 8 Broadcaster Press June 19, 2018 www.broadcasteronline.com USDA Launches Interactive Map Of Opioid Epidemic Resources WASHINGTON, June 14, 2018 – Assistant to the Secretary for Rural Development Anne Hazlett today unveiled a new interactive feature on the United States Department of Agriculture’s (USDA) rural opioid misuse webpage. Now webpage visitors can use an interactive map to learn about, access or replicate actions rural leaders are taking in small towns across the country to address the opioid epidemic through prevention, treatment and recovery opportunities. The interactive map can be viewed at https://www. usda.gov/topics/opioids/resources-map. “Leaving no community untouched, the opioid epidemic has taken a monumental toll on many of the small towns and rural places that are the heartbeat of our country,” Hazlett said. “USDA is a strong partner to rural leaders in addressing this issue through programs for prevention, treatment and recovery, as well as programs that build rural resilience and prosperity for the future.” USDA collected model practices displayed on the interactive map from regional opioid misuse roundtables and through the “What’s working in your town?” form on the USDA opioid misuse webpage. USDA invites you to share effective actions taken in response to the opioid epidemic in rural communities by filling out the “What’s working in your town?” form. At the direction of President Trump, the United States Department of Agriculture (USDA) has been keenly focused on addressing the opioid crisis in rural communities. So far, the Department has convened regional roundtables to hear firsthand accounts of the impact of the crisis and effective strategies for response in rural communities; launched an interactive webpage on opioid misuse WORK WITH THE Decision Makers in rural America featuring resources for rural communities and individuals facing the crisis; and prioritized investments in three key grant programs to address the crisis in rural places. For more information about these efforts, visit the USDA rural opioid misuse webpage at www. usda.gov/topics/opioids. In April 2017, President Donald J. Trump established the Interagency Task Force on Agriculture and Rural Prosperity to identify legislative, regulatory and policy changes that could promote agriculture and prosperity in rural communities. In January 2018, Secretary Perdue presented the Task Force’s findings to President Trump, which included 31 recommendations to align the federal government with state, local and tribal governments to take advantage of opportunities that exist in rural America. In the area of quality of life, the Task Force included a recommendation to modernize health care access. The report highlighted the importance of telemedicine in enhancing access to primary care and specialty providers. The Task Force also found that improved access to mental and behavioral health care, particularly prevention, treatment, and recovery resources, is vital to addressing the opioid crisis and other substance misuse in rural communities. To view the report in its entirety, please view the Report to the President of the United States from the Task Force on Agriculture and Rural Prosperity (PDF, 5.4 MB). In addition, to view the categories of the recommendations, please view the Rural Prosperity infographic (PDF, 190 KB). USDA Rural Development provides loans and grants to help expand economic opportunities and create jobs in rural areas. 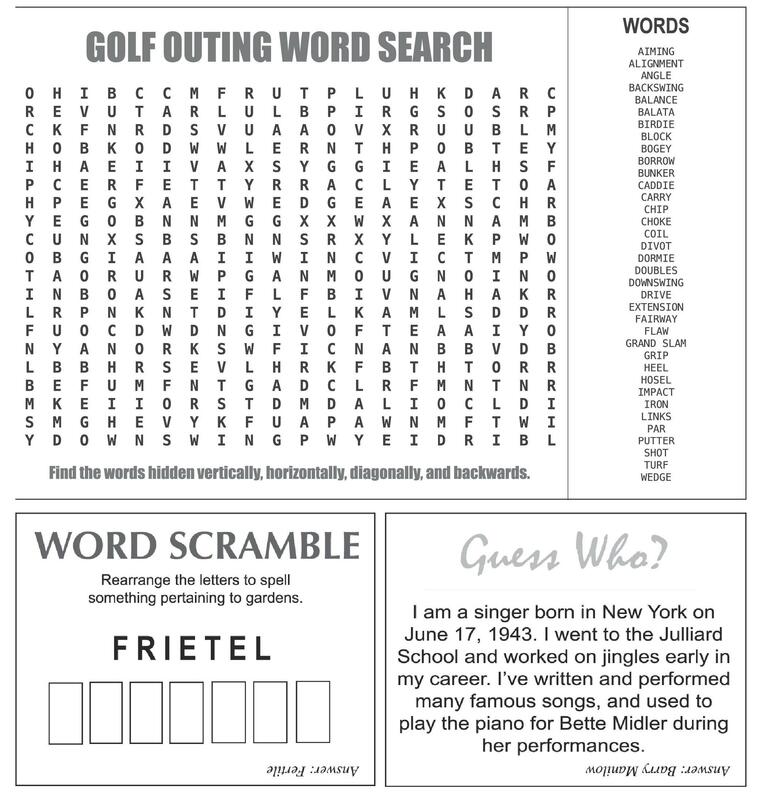 This assistance saw it in the Tell them you supports infrastructure improvements; business develBroadcaster! opment; housing; community services such as schools, public safety and health care;Tell high-speed internet access in and them you saw it in the Broadcaster! rural areas. For more information, visit www.rd.usda.gov. 624-4429 www.broadcasteronline.com Tell them you saw it in the Broadcaster! 201 W. Cherry, Vermillion 624-4429 www.broadcasteronline.com Tell them you saw it in the Broadcaster! 201 W. Cherry, Vermillion 624-4429 www.broadcasteronline.com Raise your expectations. 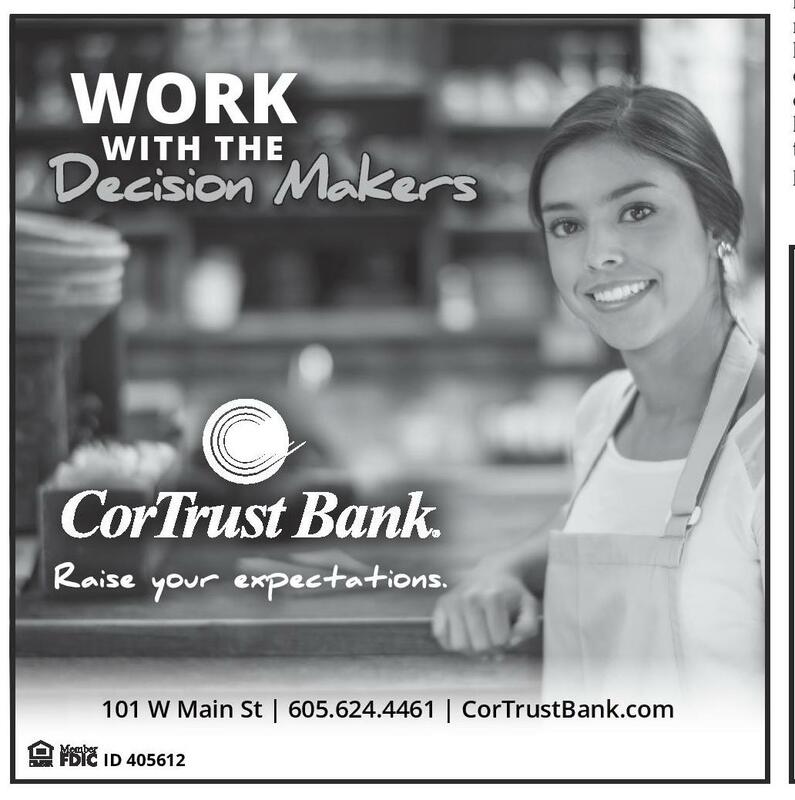 101 W Main St | 605.624.4461 | CorTrustBank.com ID 405612 Matheson has a new local Vermillion and Elk Point area Dealer. 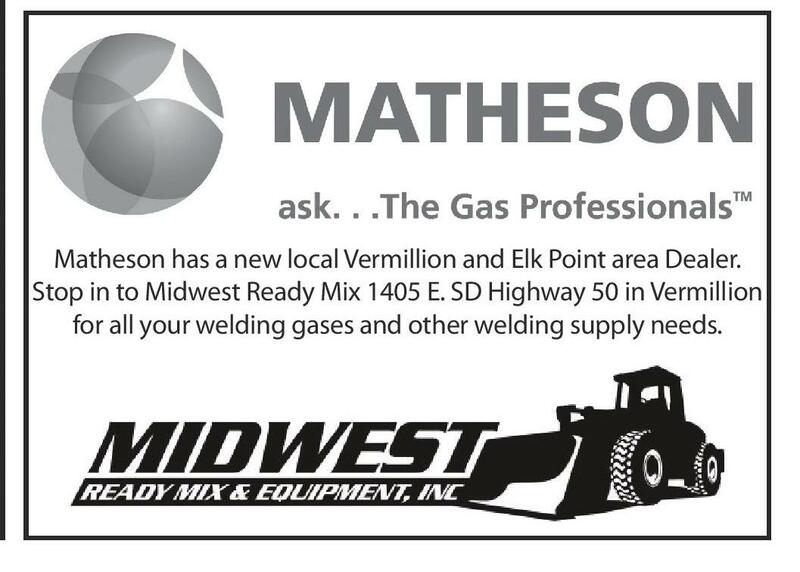 Stop in to Midwest Ready Mix 1405 E. SD Highway 50 in Vermillion for all your welding gases and other welding supply needs.